The bucket elevator is the most efficient means of vertically conveying flow able material. Hunter manufactures Legs in capacity from 100 BPH to 250,000 BPH. 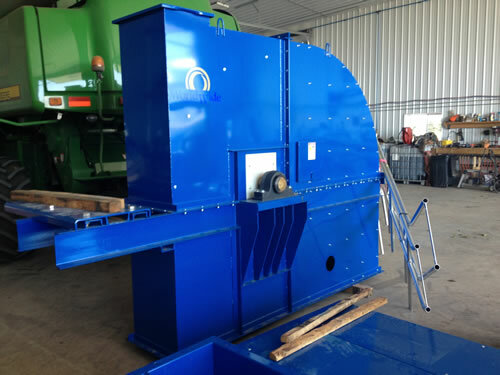 The Head Section has been designed from 60 years of testing resulting in the Hunter WorldWide bonnet (center line of pulley to top of head section) this larger design allows product to expand as it is being discharged from the bucket. Any conveyed product requires additional space when the product changes direction. As product is discharged from the Bucket into the head section the large bonnet space is required to allow product to properly discharge from the head section. Bonnet and throat lined with AR Plate is standard. Full size explosion relief panel, is located in the backside of the head directly in line with the up leg. Options include heavy gauge steel, Server duty bearings, AR Plate, Urethane, and Ceramic. Bucket Elevator Legging is nothing more than an item to support the bucket elevator head section. Our legging is manufactured in individual tubes with a legging frame brackets. This is done to asset in transportation, and is assembled in the field with cross members. We offer legging in standard gauges, heavier gauge steel is available, or Corner Angle is available if requested. 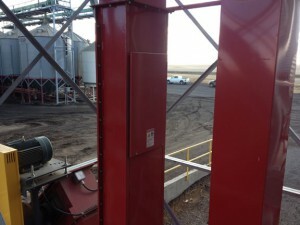 Boots are designed support the Bucket Elevator and to load product into the buckets. Our boots can be manufactured out of a variety of materials and steel thickness. To properly load the elevator the boot hoppers have to be in the correct location. Boots hoppers are installed in the top position on the upside, in the lower position on the down side. This Boot Hopper installation configuration is mandatory for proper bucket loading. Liberty is the smallest Unit Hunter manufactures with a 16” Pulley although small in size it is built for Commercial use. 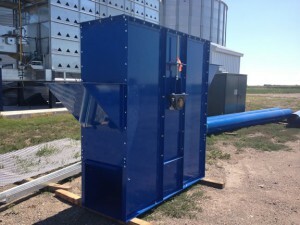 Lincoln series is manufactured with a 30” Pulley and a large housing capable of conveyance of may products. Franklin Series in manufactured utilizing a 42” Pulley the smallest of our commercial series. Monroe Series is designed to convey larger capacity and offers multiple rows of buckets.